Please inform your acupuncturist of any adverse or questionable reactions you may have in response to the herbals or any positive changes that you have noticed. The herbal remedy may be modified accordingly. What Do I Need To Know About Acupuncture? What Other Modalities Are Used? How Does Acupuncture Fit Into The Western Medical Model? 1. What Do I Need To Know About Acupuncture? Acupuncture is related to the forces of nature. Qi (pronounced “chee”) is the original concept associated with acupuncture and in relation to nature, would be the energy and pathways carved by a river which courses its way between banks, never ending and in perpetual motion. 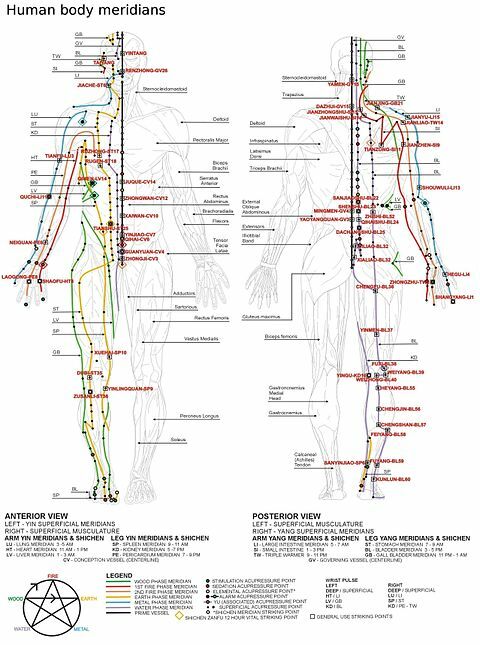 The Qi in our body flows through meridians and pathways in a similar fashion. Disease occurs when this flow of energy is interrupted. The cause may be related to emotions, diet, lifestyle or numerous other factors to be determined on assessment. Acupuncture works to correct these imbalances and remove the obstacles that ultimately hinder our health. The concepts of Yin and Yang, mutual and interactive, are applied to the philosophy of balance and are represented in our bodily systems.Please inform your acupuncturist of any adverse or questionable reactions you may have in response to the herbals or any positive changes that you have noticed. The herbal remedy may be modified accordingly. 2. What Does Acupuncture Feel Like? Acupuncture makes use of very thin needles that are inserted into acupuncture points. These points are not randomly selected but have been chosen based on over 2,500 years of study and practical expertise originating in China. In Chinese, acupuncture is “butong” which means painless, however, there is a definite sensation associated with acupuncture. One should not feel pain associated with the insertion, but may feel a “needling sensation” that is generally difficult to describe but may be reported as tingling, a mild ache, numbness or warmth. This feeling is the experience of Qi activation or “De Qi” which means getting energy movement. It is important to seek treatment from a qualified acupuncturist in order to reduce risk of adverse effects. 3. What Other Modalities Are Used? The application of medicine in Chinese Medicinal Philosophy is patient specific and as such, one of a variety of modalities may be used to treat your condition. Along with Acupuncture, your practitioner may choose to use procedures such as, Moxibustion, Cupping, Guasha, Electromagnetic Stimulation, Acupressure or Tuina-Chinese Remedial Massage. The selection of treatment modalities will be based on the assessed condition. Moxibustion is the burning and application either directly or indirectly of the herb artemesia vulgaris or mugwort, over the affected area. Cupping involves application of cups using heat and suction to resolve the imbalance. Guasha is an ancient technique that resolves conditions of chronic or acute pain and constrictions using a smooth edged tool, often a spoon.. Electromagnetic Stimulation involves the application of mild pulses of electricity to the needles or through TENS pads placed on the body, in order to stimulate nerves via the acupuncture point. Tuina, is a remedial therapeutic massage that incorporates various techniques to manipulate the meridians and acupuncture points of the body.xperience of Qi activation or “De Qi” which means getting energy movement. It is important to seek treatment from a qualified acupuncturist in order to reduce risk of adverse effects. Stimulation of acupuncture points is believed to activate high threshold muscle sensory nerves. These nerves send neural messages to the brain (or spinal cord) where neuro-chemicals and hormones are released. The chemicals released act to either alter the reaction to pain or to stimulate the release of other chemicals, such as endorphins, which in turn act to encourage the body towards self-regulation and healing. Basically, pain relief occurs as a result of pain or the sensation of a stimulus, in one part of the body inhibiting pain responses in another part. Acupuncture assists the body in maintenance of health by stimulating the body’s own natural defenses and resistance to disease. Acupuncture and Traditional Chinese Medicine work to correct the imbalances and restore our body to its optimum performance. Life thrives when the rivers flow. 5. How Does Acupuncture Fit Into The Western Medical Model? Acupuncture can deal with many acute and chronic conditions. The World Health Organization lists over forty conditions that may benefit from acupuncture. Traditional Chinese Medicine is an evolving system, which seeks an integrative approach to health. As such, traditional means of healing work in a complementary fashion alongside modern allopathic medical practices. 6. Which Conditions Can Be Treated With Acupuncture? Acupuncture works to re-establish a balance in the body. Disease or states of ill-health manifest due to these imbalances. Application of this approach to mediating disease states, allows for successful treatment of many conditions including but not exclusive to, Anxiety & Depression, Arthritis, Chronic Degenerative Diseases, Headaches/Migraines, Sciatica, Prostatitis, Psoriasis, as well as numerous conditions affecting women such as, Infertility, Menopause, Premenstrual Syndrome, Pre and Post Birth conditions. 7. What to Expect From Your Acupuncture Treatment? The first treatment is somewhat longer than the subsequent visits, as you are required to complete the intake forms which will be reviewed with you and the practitioner. It is advisable that you not receive treatment on a totally empty or full stomach, or if you are extremely tired. The initial treatment takes 1-1/2 hours. Follow-up treatments typically take one hour. A treatment consists of first talking with the acupuncturist about your symptoms and health concerns. Consideration is given to the complete lifestyle of the patient including exercise, diet, work and sleep habits. The acupuncturist will take your pulse as part of the diagnosis, look at your tongue, and may palpate your abdomen. Lastly, hair thin sterile and disposable needles will be inserted in different locations based on your Chinese Medicine diagnosis. Upon insertion, you may feel a slight pinch, tingling, electrical sensation, or mild aching feeling. Once the pins are in place, most clients feel very relaxed or even fall asleep. Your acupuncturist will develop a treatment plan with you. Usually clients receive treatments 1-2 times per week. Some bruising or bleeding may occasionally occur after needling. This is nothing to be alarmed at. If you have a bleeding disorder or are on blood-thinning medications, you should inform your acupuncturist before undergoing treatment. If you are pregnant or have a pacemaker, tell the acupuncturist so that appropriate herbs and acu-points will be chosen. All complementary medicine has a cumulative effect and is a progressive treatment. It may take several treatments for you to notice any change, although you may note subtle changes and effects. The number of treatments required depends upon the duration, severity and nature of your health condition. Two or three treatments may be sufficient for an acute condition, while a series of 5 to 15 treatments may be needed to resolve chronic conditions. Some degenerative conditions may require on-going treatments over a longer period of time. It assists the practitioner immensely if you can note any changes both negative and positive, that have occurred over the period of time between treatments. Your acupuncturist is knowledgeable and qualified in prescribing and dispensing the herbal remedy that is best for you. Your acupuncturist may recommend Chinese Herbal Treatment for your condition or may recommend Nutritional and Herbal Supplements if your condition warrants it.